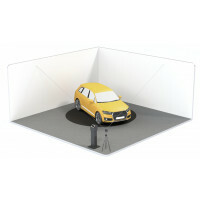 With this car turntable you’ll create professional photo series with ease; Pre-Motion also provides construction accessories like a car-bearing elevated floor with a sloping side. This will make it easy to drive cars into and out of your photo space. Optionally with photo walls and flexible positioning software (360° control). Would you rather just buy the turntable, without construction accessories? Choose our Basic Solution. We also offer a Total Solution: a complete photo studio box. Have you already got a nice photo corner, or are you creating a new photo space? With a high-quality car turntable, your company will be photographing cars for years without any problems. With this Top Solution, a turntable is incorporated into your photo space without having to modify the existing floor. A set of photo walls from Pre-Motion can help you realize your photo corner concept fast, without the need for an interior builder. 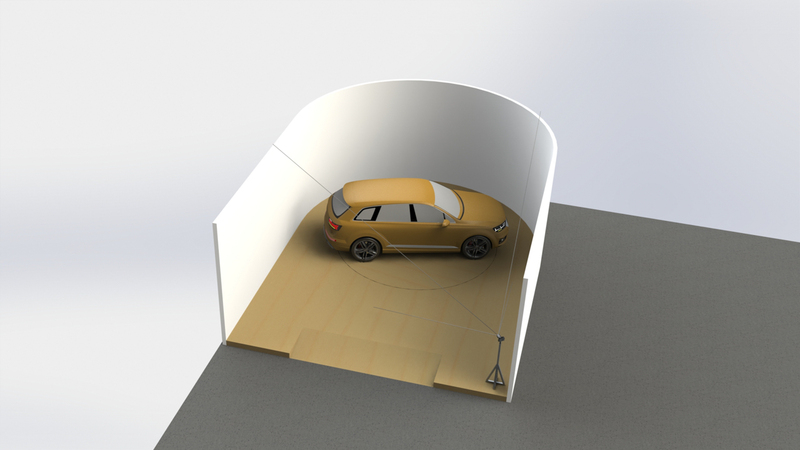 This solution will result in a photo corner that will give you the desired end-result: an attractive online car presentation. 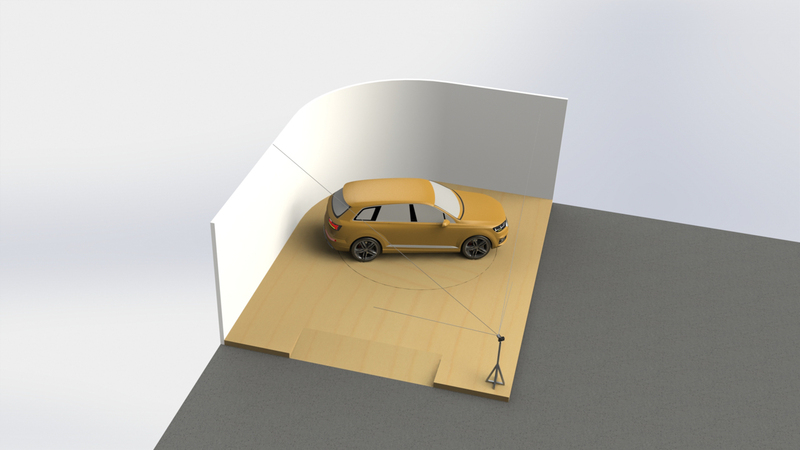 The most popular turntable for car photography is Ø 4.5 metres, with a carrying capacity of 3000 kg. All passenger cars will fit on this; including the extended Audi A8L, for instance. Do you photograph many commercial vehicles, campers and other heavy vehicles? Go for our Ø 5-metre turntable -or perhaps an even bigger one. Don’t choose a turntable that’s unnecessarily large. For good car photos, the cars have to be placed exactly in the middle of your revolving platform. An (overly) large turntable makes centering the car on the platform more difficult. We manufacture our car turntables ourselves in our workshop in Ede (the Netherlands). Our turntables are low-noise and only 15 cm high, and they’re built with high-quality parts, including motors, wheels and bearings. This ensures reliability and a long service life. The turntable comes with basic controls: start/stop, left/right and speed. Want to photograph all cars from the exact same angles? Upgrade your controls with optional automatic positioning, camera control or photo organizer. 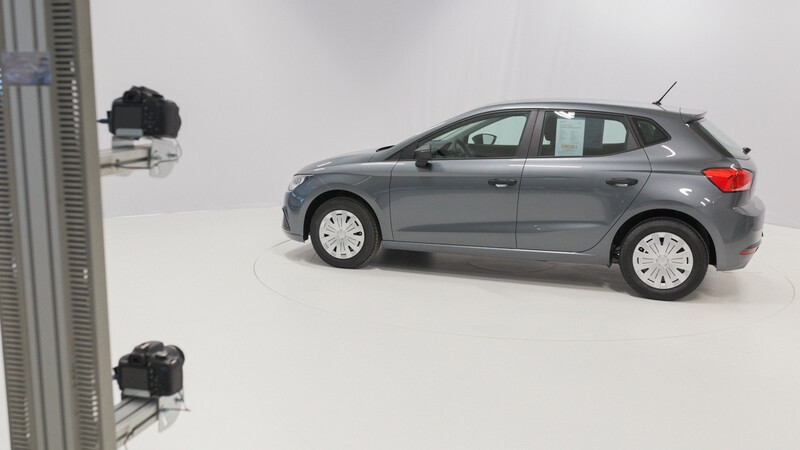 Choose from various control options for optimal 360° car photography and 3D animations! 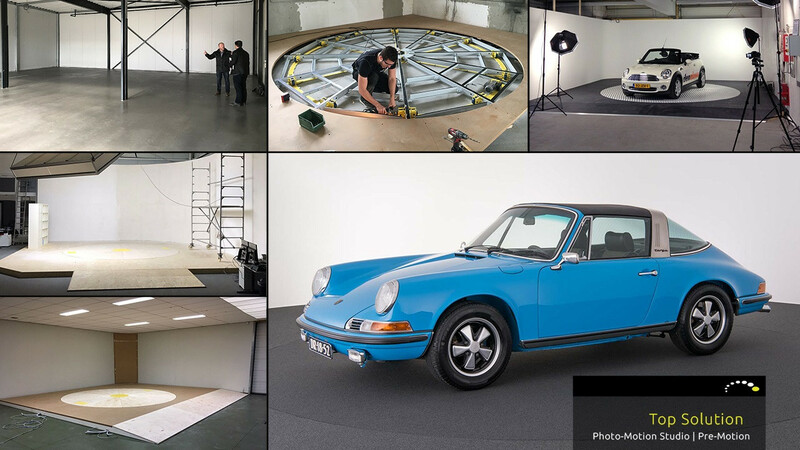 For car photography it’s best, in both an aesthetic and a practical sense, to either 1) construct an elevated floor around the turntable or 2) recess the turntable in a floor yet to be poured. This way, driving on and off the platform will be easy and the turntable will be almost invisible in your photos. 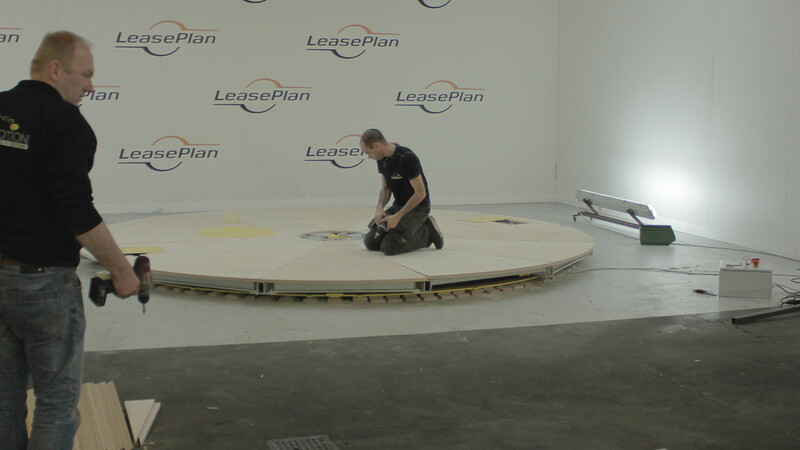 Pre-Motion installs the turntable on your floor and builds an elevated floor around it. 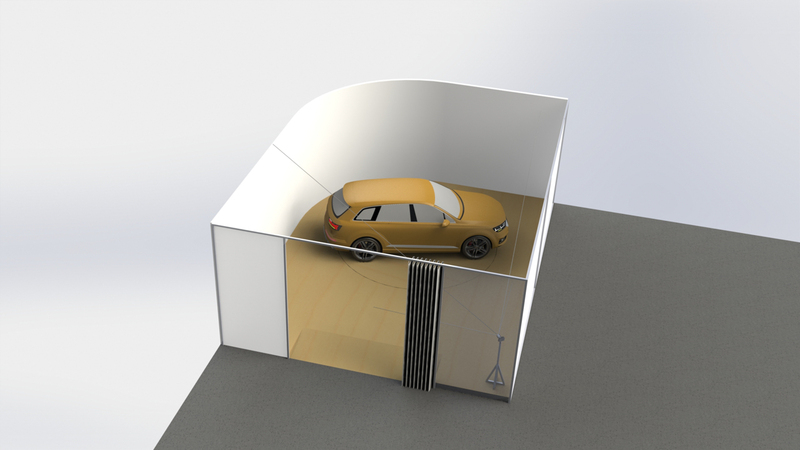 This car-bearing floor has adjustable feet to fine-tune its height. This way we can correct for minor imperfections in your original floor. Using a laser we position the turntable at the exact same height as the surrounding elevated floor. 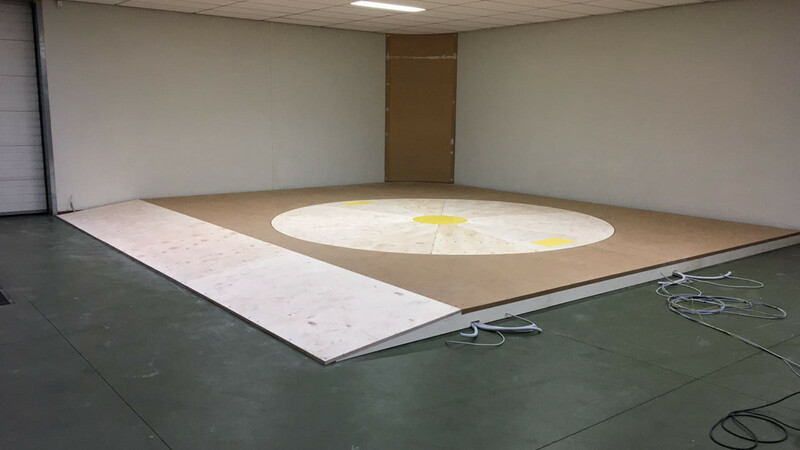 The elevated floor will match the turntable’s height perfectly and will by default measure 6.5 x 7 metres. Optionally, we can adjust its size to your space. 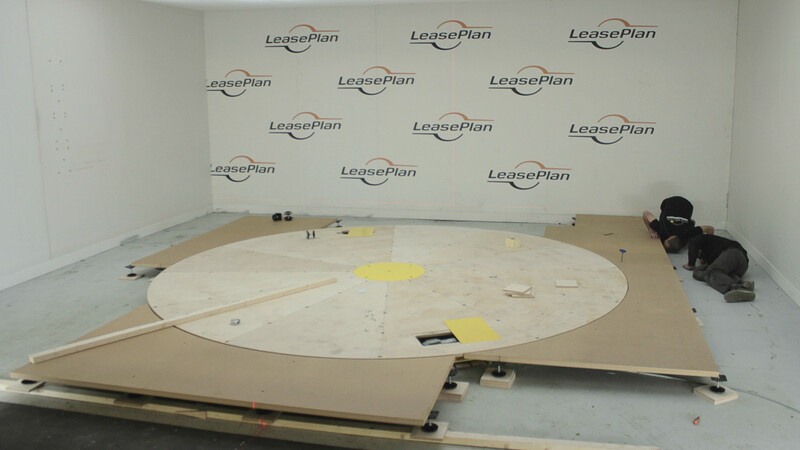 Photo: installation of a turntable with surrounding elevated floor and sloping side. Do want to have your turntable installed recessed in a new floor? 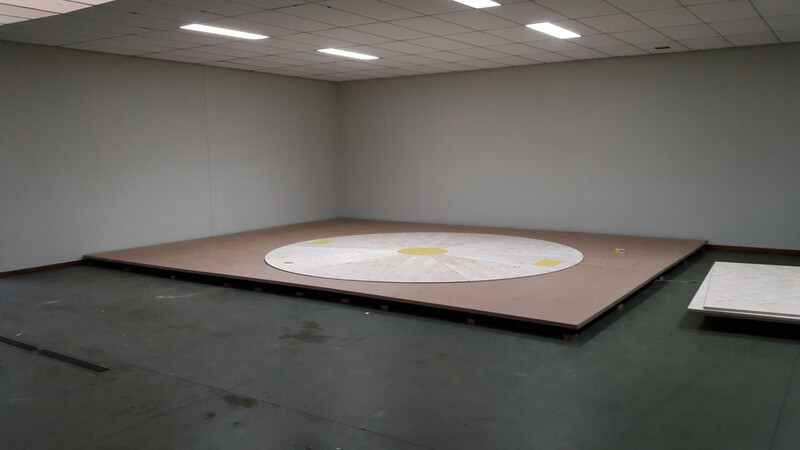 Choose our Basic Solution: a photography turntable without surrounding elevated floor. Read more about the differences between recessed and surface-mounted installation on our web page about turntable integration possibilities. 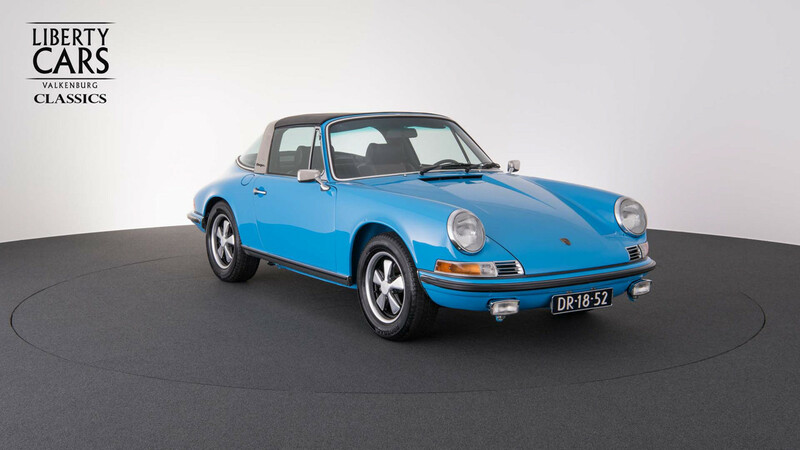 In the end, all you really care about is the final result: high-quality photos of your cars. A properly-lit photo space, combined with the right camera position, is crucial to achieve this. As a turntable manufacturer we’ve not only invested in engineering solutions, but also in expertise concerning lighting and photography techniques, in order to assist you in this area. Lighting circumstances will be different for each business location. If you decide to go for a Pre-Motion turntable, a lighting expert can come and offer advice at your location. Based on their recommendations, we’ll suggest a suitable lighting plan. Naturally, you may also turn to your own photographer for lighting advice. Do you have questions about this Top Solution for car photography? Feel free to contact a turntable specialist from Pre-Motion. Want to improve the quality of your car photos right away? Check out our car photography guide! Have you developed your own concept and are you looking for a manufacturer of high-quality turntables? Pre-Motion can be your partner as a turntable supplier. We’ll gladly make individual arrangements with you. Depending on the number of turntables you need, we can agree on a price. If so desired, we can also deliver under white label. Looking for a full-blown studio box for your location? 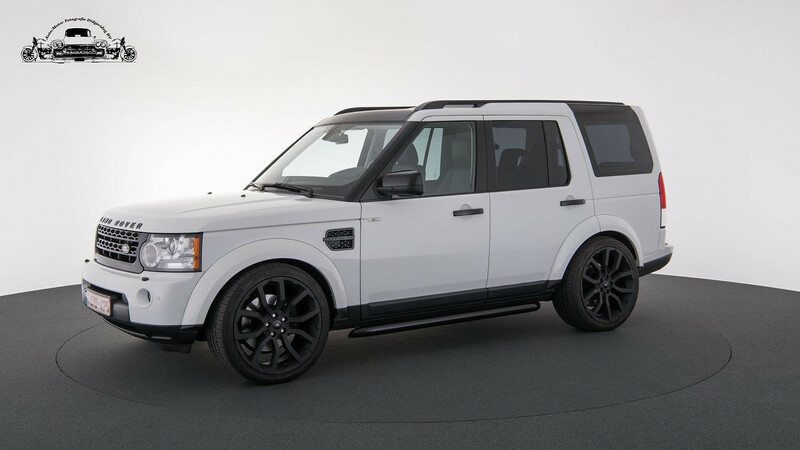 Check out our complete photo studio for car photography. 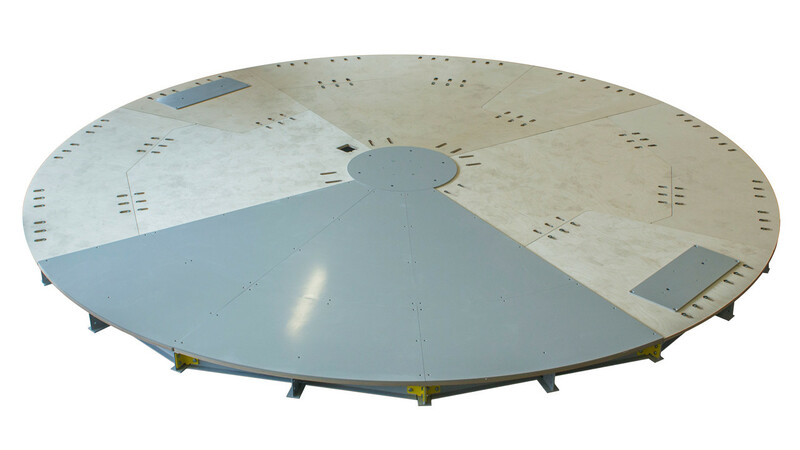 The turntable is manufactured and tested extensively at our workshop in Ede. We’ll install the turntable with accessories in your space on the pre-arranged days. 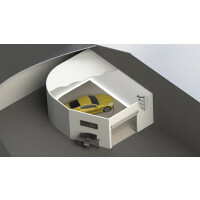 Depending on the options chosen, installation can be completed in just a couple of days. 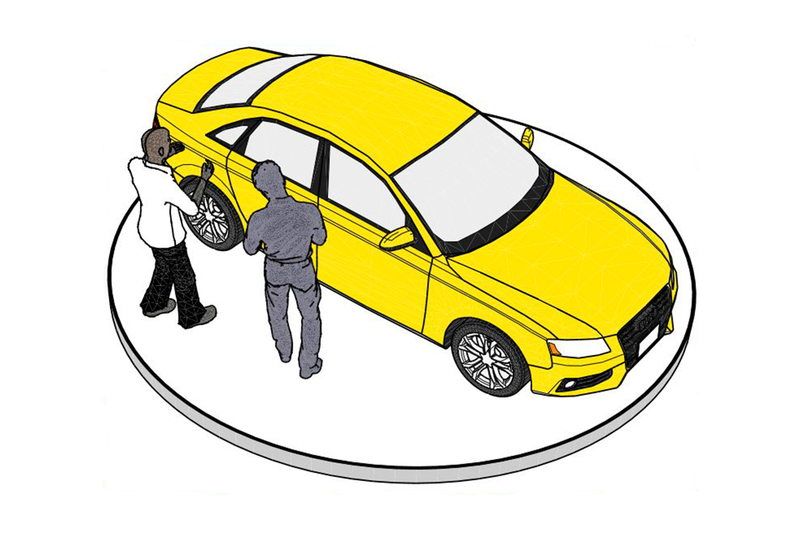 After installation, a Pre-Motion employee will explain how the turntable works. Once your photo space is completely finished, including proper lighting, you can start taking photos! The platform comes equipped with basic controls: start, stop, clockwise rotation, counter-clockwise rotation and adjustable speed. With these controls you can start and stop the revolving platform at the push of a button. You take photos manually. This basic control system is also available with optional remote control. 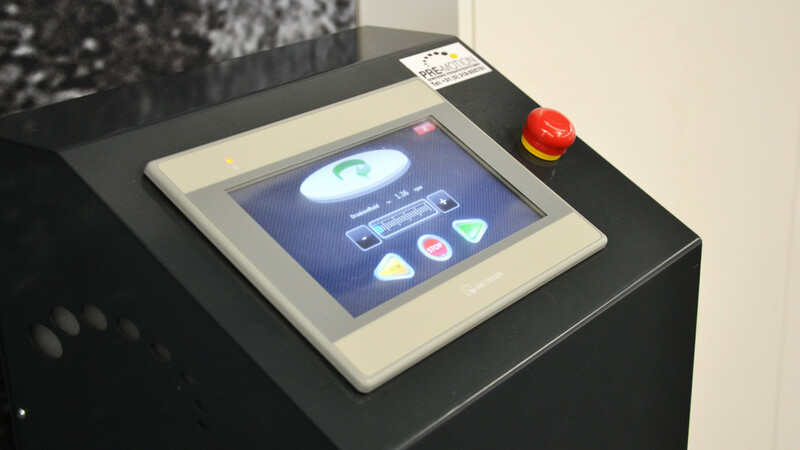 On a touch panel you can create rotation programmes to an accuracy of one degree; the turntable will follow the programme you’ve entered. At each stop the turntable signals your camera to take a photo. After each photo the turntable rotates to the next position, until the entire programme has been run. In addition to this ‘stop programme’ you can also have the turntable rotate continuously, for 360-degree video recording, for instance. For this purpose, you can adjust the rotation speed. Are you processing many cars a day and is organizing photos a time-consuming task? Or are you taking photos for various customers, each with their own requirements? This control option will come in extremely handy. The Photo-Motion software allows you to create several workflows and export profiles. The photos are no longer stored on the memory card inside the camera, but organized on your PC right away, in a separate folder for each car photographed. This system can be optionally expanded with several cameras for 3D-video animations. Both the turntable and the camera(s) are controlled by the PC. Read more about turntable control and positioning. Do you have a back wall that’s already suitable for photography (with a lick of paint)? Or is the back wall part of your building or renovating plans? If not, we can supply wall elements that can help you realize your photo space quickly. Pre-Motion offers wall elements in 2 shapes: L-shape or U- shape. 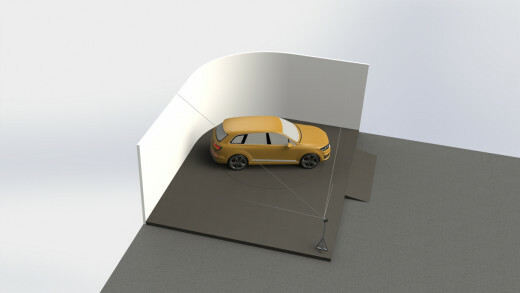 Optionally, the wall set can be extended in 0.5-metre increments. To shut out unwanted ambient light, a white curtain on the open side is a smart and simple solution. This way, the outside will not be reflected in the car and all internal lighting is reflected back into your photo corner. We sturen u de brochure van Car turntable & construction accessories | Top Solution toe zodra u onderstaand formulier invult. We nemen over een week per mail contact op om te kijken of we u verder kunnen helpen.